I went to cycling the other day. Usually, I don't have the specific objects before pedaling, just turn the front wheel to the direction. At this time, I had a thing to see. 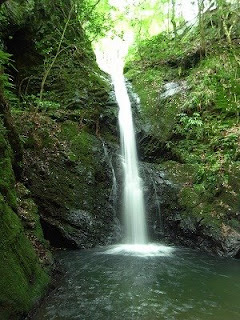 A waterfall called Bodai no taki which is located in Ukyo-ku Keihoku. Probably, I was affected by the waterfall-watching tour J-Hoppers Hida Takayama had organized. Start from Senbon-Kitaoji through Bukkyo Uni. 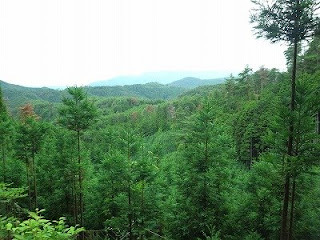 , Genkou-an and Koetsu-ji and get into the wood. There is a very old teahouse namaed Kyomi touge chaya on the way. The name means a teahouse on the Kyoto viewing pass. My shirt was wringing wet with sweat. I had hoped to see the city between trees, but forgot to see it, and have been the backside of the mountain already. 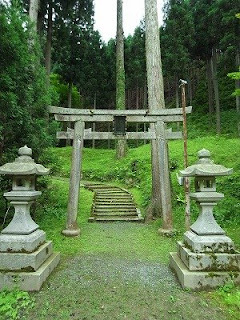 Take the way to Sugisaka, and soon see a shrine dedicated to Ono no Michikaze who is known as God of Calligraphic. 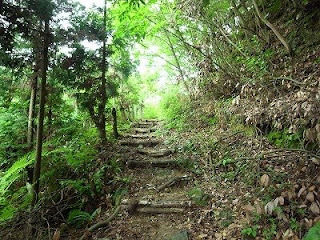 Go to west like a drawing an arc, then pass Nakagawa villege, get back to the Tokaido shizen hodou. For a while later, you will see Bodai no taki. This is that. 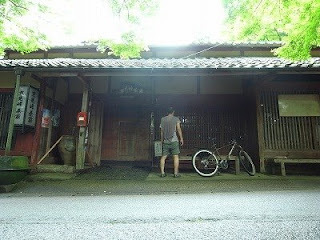 A small elegant curtain... You have to carry your bike sometimes on the way back to Takagamine. Oh yes I've been there too last year. :-) The path in the wood is GREAT to ride !! !